GaG, Howdy, dorker, wtf, 4life, and #2. Yes it did, in La La Land. Trump is the guy who threatens to shoot himself when the cops show up. 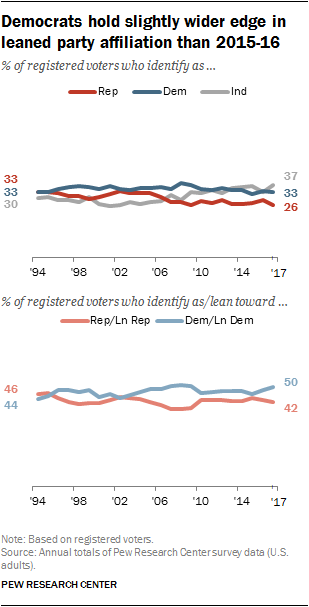 According to that Pew Poll, Democrats are actually UNDERsampled in the Reuters poll. Last edited by justthefacts; 02-12-2019 at 07:29 AM. Don’t make me post my “Blazing Saddles” Cleavon Little hostage bit again! I think much of what you say can work for a person who is trying to negotiate. If the other side is more anxious to make a deal, not engaging and appearing to have other priorities than them may cause the other side to settle sooner when you do engage. I'm not saying he's an honest negotiator or even a "fair" negotiator, but I think he's very effective more times than not. Can you share an example of a great deal he's made during his time as President? Oh wait, I've got it! He got a tax cut to the rich! That's really about all he's done. Your disclaimer reads, no I am not this stupid. Very good. Was it funny though? I'm working on my comedy show. You need to work on it. Appreciate the attempt. Until someone can really say what he has done as to a negotiator, he hasn't done much of anything except over ride much regulation that protects the people and environment while favoring large businesses. We're going to have serious problems down the road if the GOP doesn't reign him in. No, you got it. The only big thing he has actually accomplished was the easiest thing to ever do as a politician - cut taxes. And the taxes he cut were extremely heavily weighted toward the wealthiest people. The GOP won't reign him in, they are a combination of extremely corrupt and extremely spineless. Our only hope is for the American public to reign him in. And given that a solid proportion of the American public is as misinformed, ignorant, and deluded as the RW nutjobs exemplified on this board, good luck to us, I guess. Worse, the backlash to Talk-Radio/Fox-News-Trumpism is strong leftism, and that will not help the problem, the solution of which is a return to facts, reason, compromise and normalcy. Last edited by cncmin; 02-12-2019 at 05:30 PM. The reality: he's below water in GOP stalwarts GA, NC, UT, and MO, and barely breathing in GOP stalwarts of AK, TX, NE, and MT. If approval rating translates to electability, he has almost zero chance in 2020 barring the Dems putting up a significantly worse candidate than HRC. Last edited by cncmin; 02-12-2019 at 05:36 PM.